IBC Chapter 33 provides minimum safety precautions for fire during construction and the protection of adjacent public and private properties. The section includes provisions for fire extinguishers, standpipes, means of egress, and sprinkler system commissioning. The IFC also contains detailed requirements for fire precautions during construction. on all floor levels with combustible materials, in each storage or construction shed and where special hazards exist, such as the storage and use of flammable and combustible liquids. Required means of egress must be maintained at all times during construction, demolition, remodeling or alterations and additions to buildings. During construction, when a building height reaches 50 feet or four stories, a minimum of one temporary lighted stairway shall be provided unless a permanent stairway is available for use at all times per IBC Section 3310. In buildings required to have standpipes, not less than one standpipe shall be available during construction for fire department use. The standpipe shall be installed before the construction is 40 feet above fire department access. The standpipe is placed adjacent to usable stairs and has fire department hose connections. The standpipe is extended during construction to within one floor of the highest point of construction having flooring per IBC Section 3311. During demolition a standpipe shall be maintained in operable condition. The standpipe may be demolished floor by floor as demolition proceeds, but not more than one floor below the floor being demolished. The sprinkler system must be tested and approved before the certificate of occupancy is awarded per IBC Section 3312 and the building is occupied, except as provided in Section 111.3, temporary occupancy. ▶ Temporary heating equipment must be listed and labeled; installation and maintenance of the equipment must be in accordance with the listing (IFC 3303). ▶ Smoking is prohibited except in approved areas with posted signage (IFC 3304). ▶ A fire watch must be maintained with qualified personnel if required by the fire code official (IFC 3304). ▶ Welding operations must follow the provisions of IFC Chapter 35. Electrical wiring must follow the provisions of NFPA 70 (IFC 3304). ▶ The owner must designate a fire prevention superintendent responsible for the fire prevention program during construction. Requirements for the program are listed in IFC Section 3308. ▶ An accessible emergency phone is provided in an approved location at the construction site. The construction site street address and fire department emergency phone number must be posted by the phone (IFC 3309). ▶ Fire-fighting vehicle access must be provided within 100 feet of temporary or permanent fire department connections (IFC 3310). ▶ An approved water supply for fire protection must be available when combustible material is at the construction site (IFC 3312). ▶ Requirements for safeguards during roofing operations are listed in IFC Section 3317. Although less than 2% of building fires occur during construction, this phase presents unique risk scenarios that make any building more vulnerable regardless of material. The IBC provides extensive safety precautions for this phase, but the fires that do occur are often caused when required elements—such as fire doors, smoke alarms and sprinklers—have not been put in place. For this reason, construction site fire safety includes some unique challenges that are best addressed through education and increased planning. A new website, www.constructionfiresafetypractices.com, offers information and resources on construction fire safety from a broad range of sources. It identifies best management practices, places emphasis on personal accountability of stakeholders, and provides guidelines for using model codes and standards to reduce fire loss. 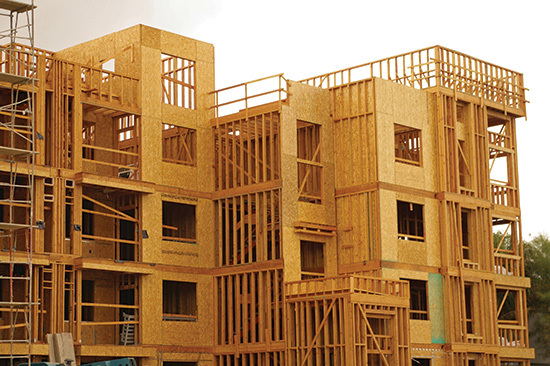 Wood construction offers advantages in terms of cost, design versatility and sustainability—while meeting code requirements for safety in buildings that range from schools and offices to mid-rise/multifamily, civic, institutional, industrial and retail. Building codes are paying less attention to the combustibility of the building components and more attention to design and construction techniques intended to improve fire resistance and protect life safety. As such, the restrictions for large wood buildings are quietly disappearing, as required levels of structural and fire performance are being emphasized in the code. Wood has a history of proven structural and fire performance, and is making history with new mass timber products such as CLT, which offer exceptional strength and continue to expand the possibilities wood design. For more detailed information on the subjects covered in this CEU, a new version of the American Wood Council’s Code Conforming Wood Design based on the 2012 IBC is available as a free download at www.awc.org.